The fifth Teacher Educator Conference 2015, jointly organized by British Council, India and the English and Foreign Languages University, Hyderabad, was held at the Hitex International Convention Centre between 27 February and 1 March, 2015. The theme of the conference this year was ‘Ensuring Quality in English Language Teacher Education’ and it had thousands of delegates and speakers from 25 countries (teachers, teacher-educators, academics) in attendance in what is reportedly the world’s largest teacher-educator conference. There were several plenary speaker sessions, panel discussions and debates apart from parallel paper presentations and workshops. Tea-breaks and lunch were used as networking opportunities. The idea that the quality of education will improve when teachers’ professional development is supported was brought out right at the beginning of the conference by the theme which focussed on aspects of quality in teacher education in English Language Education. The Vice Chancellor of EFLU, Prof. Sunaina Singh called for a continuing association with British Council and emphasized the need to look at quality as a process of improvement that adds great value to society. Invoking the traditional ideas of ‘the teacher as god’ (aacharyadevobhava) and ‘from darkness to light’ (asatomasadgamaya), the Governor of Andhra Pradesh and Telangana, H.E. ESL Narasimhan pointed to the democratisation of education in India through the Right to Education Act (RTE), and underscored the unique linguistic diversity that the country enjoys. In our enthusiasm to promote the learning of English, which he agreed has great instrumental value, the Governor warned against neglecting the knowledge of one’s mother tongue, and also of the possibility of English becoming an elitist tool that creates a society of haves and have-nots. He stressed the need for promoting English in government schools, and vouched for the perception of the burgeoning young population as untapped human resource potential. Mr. Rod Bolitho, Academic Director of NILE, UK, set the tone for the conference in his keynote address by looking at what he called the ‘push’ factors and the ‘drag’ factors affecting the quality of teacher education in India. In his perception, English needs to become part of all early/basic literacy programmes. He also recommended effective gatekeeping at exit points of teacher pre-service education programmes to ensure quality. A problem he highlighted was that of good teachers being promoted into administrative roles, which required very little teaching. He averred that we need to retain good teachers in the classroom more than in administrative roles. Dr. Amol Padwad, speaking on the motivation of teachers in their professional development (PD), argued for increasing focus on how to motivate teachers to join, stay, and grow in their profession, by looking at the PD processes throughout their careers. Drawing on various theories of motivation, he called for creating career-contingent paths to PD and for the promotion of intrinsic motivation, by creating a sense of autonomy and sustained intellectual challenge to improve the teachers’ sense of self-efficacy. Taking a critical look at the existing pre-service teacher education programmes, Prof. Geetha Durairajan argued that in order to shift to a formative assessment-based evaluation in school classrooms, teacher education programmes themselves need to incorporate the ideas of assessment for and as learning in their curricula. The current scenario, where heavy emphasis is laid on memory-based summative assessment, creates a disconnect between what the teacher experiences in her preparatory processes and what she is expected to practise in her teaching classrooms. Prof. Durairajan also called for higher weighting for internal and formative assessment by placing greater trust in the teacher educator and her abilities to assess developing teachers. Valid inferences can only be drawn in evaluation if the test-taker and the paper-setter know each other, she argued. She added that trusting the teacher educator would be the first step towards trusting the teacher in the classroom. In the very interesting panel discussion on ‘moving from quantity to quality’ that ensued, Ms. Maya Menon of the Teacher Foundation, drew everyone’s attention to the fact that of the 1.5 million schools in India, 1.3 are located in rural areas, and that while we have 448 million children under 18 years of age, that is the school-going age, only seven million teachers are available in schools. Therefore, she said, it is incorrect to think of moving from quantity to quality and said the two need to go hand in hand in our situation. A problem she raised was with teacher educators being uninspiring and not being in touch with children. She called for getting our priorities right and for various steps including allowing for alternative teacher certification, and focussing on attracting the average young people (and not the stars) into teaching. She also stressed on the need for a rigorous school practice element in teacher education programmes in order to ensure greater quality levels. Speaking in the same panel, Mr. Colin Bangay, DFID (Department for International Development), stressed on the need to improve teacher quality to improve education as a whole. He felt that motivation, morale, and the teacher’s expectation of the learners play a crucial role in improving quality. The greatest learning happens, he said quoting studies in New Zealand, when teachers learn from and along with other teachers. Quoting Andrew Hargreaves, he emphasized the importance of school leadership in teachers’ professional development and also called for individually sought after Continuous Professional Development (CPD) by putting in place a career path which acts as a reward system for one’s CPD. The next panelist Dr. Amol Padwad reiterated the need to build a CPD culture because quality is a product of professional culture. On being asked how government money should be allocated for improving the quality of teacher education, Dr. Padwad said he would earmark nearly half the money to teacher education institutions, and divide the rest equally among the teacher, her educational institution, and the necessary teacher resources. Ms. Menon said she would invest half the money in making the teacher feel good about herself, which she felt is the biggest requirement for the system to recognize her value. Dr. Lina Mukhopadhyay, EFLU, hoped that the government would one day spend as much on education as it does on defence. Dr. Rukmini Banerjee, Pratham and ASER, spoke on the challenges and opportunities for enhancing quality in teacher education in India in the light of her work with Annual Status of Education Reports (ASER) for 10 years now. She made a case for school education being provided in the child’s home language by looking at language education as a continuum and not as neat compartments. Describing those children who failed to achieve the required ‘levels’ of reading abilities as ‘the tail’, Rukmini called for a focus on the tail. She also felt the need to think of the negative consequences of an ‘over-ambitious curriculum’, which creates a system where probably everybody is left behind. Rukmini also stressed that teachers need to teach the children and not teach the curriculum (in the form of the textbook/syllabus). As a plenary speaker, Ms. Alison Barrett summed up the various theoretical and practical aspects of teacher-education that are required to be balanced to maintain good levels of quality. In his closing plenary speech Prof. Paul Gunashekar put teacher education practices in historical perspective, and stressed on how the new pre-service teacher education programmes outlined for implementation this year need to explore ways to broaden the English curriculum by looking at reflection as part of knowledge creation/co-construction. He also evaluated existing teacher education curricula and their transactions and assessed the likely impact of renewed professional training on student teachers in a multilingual and multicultural context. The parallel sessions covered a wide variety of topics all touching upon aspects of quality in teacher education in the Indian subcontinent. The delegates were all praise for the conference and benefited a lot from the experience. What better time to launch a resource series for teachers than the Teacher Education Conference 2015? 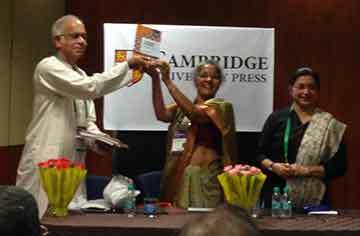 Prof. Geetha Durairajan’s book, Assessing Learners: a pedagogic resource, published by Cambridge University Press was launched on the first day of the three-day Teacher Educator Conference (TEC 15), by the well-known expert on evaluation and assessment Prof. Jacob Tharu. The book is the first in a series of books called ‘All About Language Teaching’, which is being edited by Prof. Durairajan. Speaking on why the need for such a series was felt, Dr. Durairajan pointed to the paucity of accessible, affordable and readily available material that teachers can use as a resource for practical support in their classrooms. The assumptions of the series editor that were pointed out were that – teacher capabilities will grow with help; and every teacher will take the initiative given the responsibility. The series is aimed at all teachers who want to help themselves, is affordable (the launched book is priced at Rs.145), has lots of examples, is written in an informal style, and without an intimidating tone. It also has no expectations of theoretical or prior knowledge. Two kinds of books form part of the series – one that is based on teacher education (Assessing Learners, for example), and the other on using activities in the classroom (Using Drama in the classroom, for example). Prof. Jacob Tharu put the need for the series in the larger context of the post-National Curriculum Framework (NCF, 2005) situation when the roles of the teacher and the learner have been envisaged differently. The teacher, who is now seen as an agent (and not merely as a target) of change, sees CPD as something that one takes charge of. He praised the series for the fact that unlike ready-to-use teacher manuals in the market, it represented a professional understanding that is much closer to teacher spaces, and the fact that the teacher has to move well beyond the conventional borders of her subject. Assessment, he said, has been explained as contributing to learning (Assessment for, and as learning). The first batch of books sold like hot cakes at the publisher’s stall. Look out for a review of Assessing Learners: a pedagogic resource by Geetha Durairajan in the September 2015 issue of Teacher Plus. The author taught English in schools in Delhi and Doha, for 11 years before he registered for a PhD in English Language Education at EFLU, Hyderabad. He is hoping to submit his thesis in the area of Critical Language Awareness (CLA) later this year. He is also interested in multilingualism, the politics of language, teacher education, and assessment & evaluation. He can be reached at deepesh.chandrasekharan@gmail.com.